Watching the tall trees in our backyard sway in the 60 mph winds of Hurricane Sandy (love the name, not the destruction) was a lesson in the laws of nature. As gardeners and horticulturists, we are at the mercy of Mother Nature. As the winds subsided, I saw a squirrel (Drat! The evil squirrels!) nibbling at a herb container garden on the patio. I was stunned – I have never seen a critter interested in herbs. So either the squirrel had hidden away some morsel in the container, or it was actually reduced to eating the herbs that I love. I have grown herbs in my backyard for years, but I went all out this year after seeing a beautiful arrangement in a Kinsman Garden catalog. I don’t think there is anything more satisfying than stepping outside your door and snipping fresh herbs for tonight’s dinner. Sage or rosemary with potatoes. Basil and parsley with tomatoes. Tarragon and chicken. Oregano with anything Italian. Chopped chives over almost anything. Mint with drinks or salads. Thyme with meats or roasted vegs. Or mix it up and chop a blend of herbs for a surprise taste. CRR has turned into a dried herb dervish. I prefer mine fresh but the memories driven by our own dried herbs are a blessing in dead of winter. Or even after a hurricane. 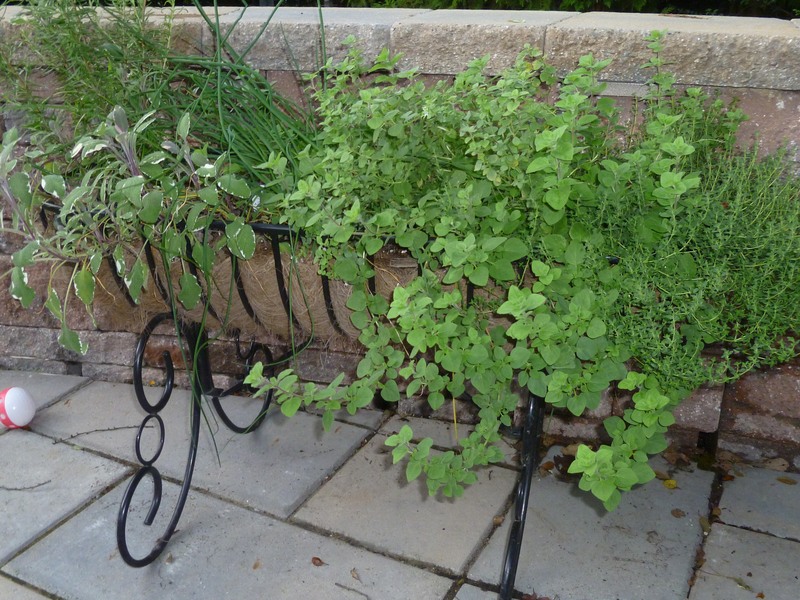 Whether you live in an apartment or have a spacious yard like ours, container herbs are a window into culinary bliss.